We are creating a series of hiking adventures that will take participants off the beaten track to explore areas of the White Mountain National Forest that few ever visit. We will be bushwhacking, using old trails, following terrain features like slides, navigating by map and compass, and more. 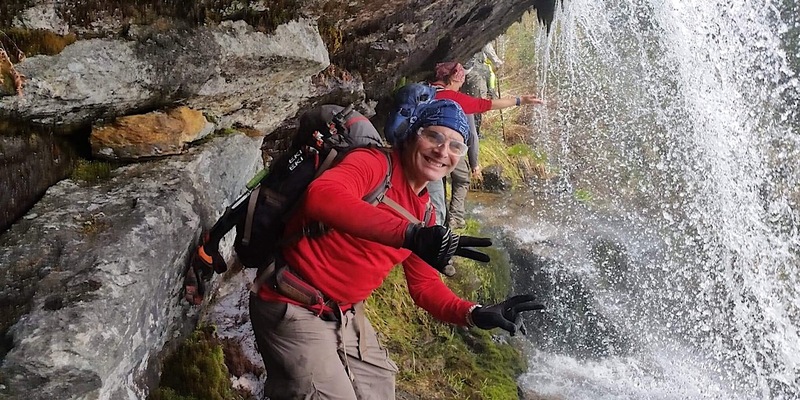 If you’ve ever taken one of our Wilderness Navigation courses this may be a perfect opportunity to put to use some of those skills so you don’t get rusty. Jump to the details. 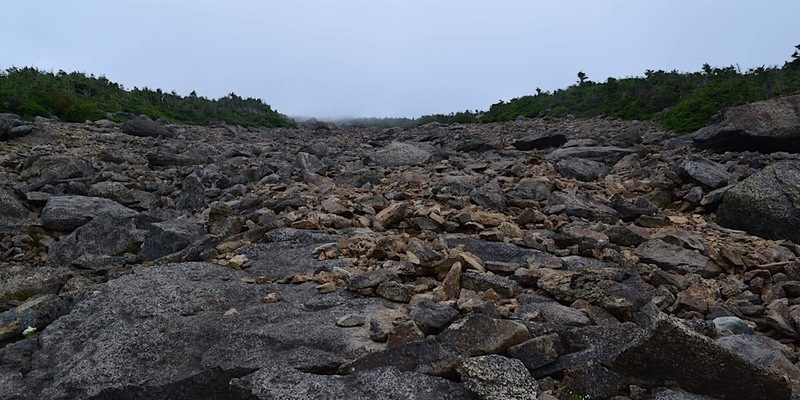 This shallow depression is located on the eastern side of Mt Washington between Tuckerman and Huntington Ravines and is part of the Cutler River Drainage area (it is a major Cutler River tributary). 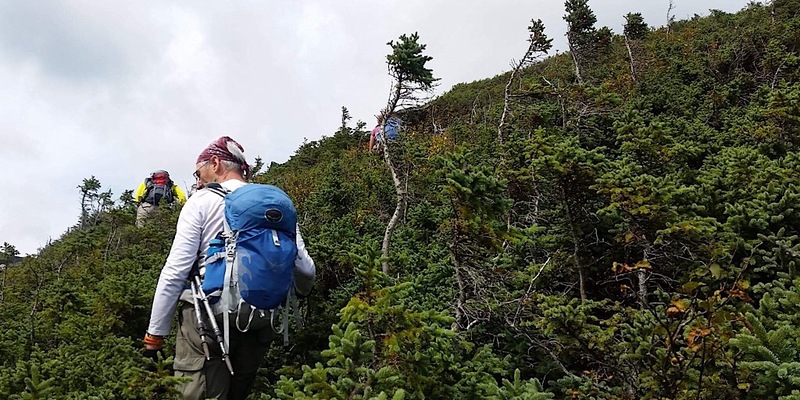 There was a trail many years ago to the four falls located along this Mt Washington ascent route but has become overgrown with a few vestigial sections. Nowadays it requires compass skills and careful picking thru the trees and brush along its approximate one-mile route. The trail starts off of Raymond Path and snakes to the Alpine Garden Trail. 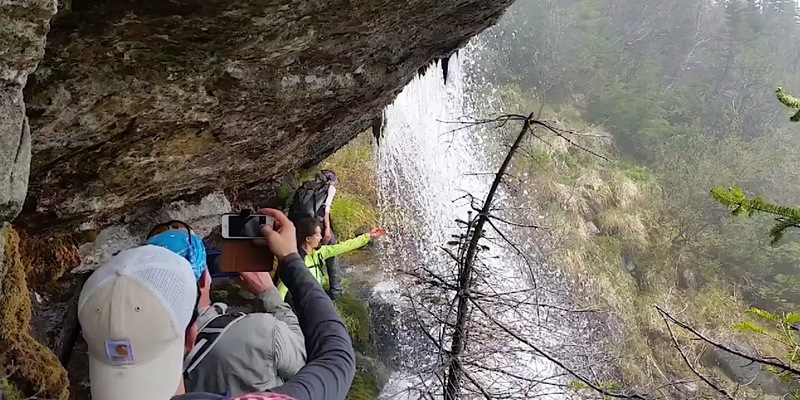 Along the way it passes four spectacular falls, one of which a hiker can either go around or pass underneath directly behind the curtain of cascading water. Once the trail is finished we then have the opportunity to view the remaining flowers along the Alpine Garden on our way to our return route which will be either Lion Head, Tuckerman Ravine, or Boott Spur Trails. There’s are many highlights along this route, but the falls are the best. Photo by Howard. Redline Guide Howard Aronson enjoying his early exploration of this route. Photo by Howard. 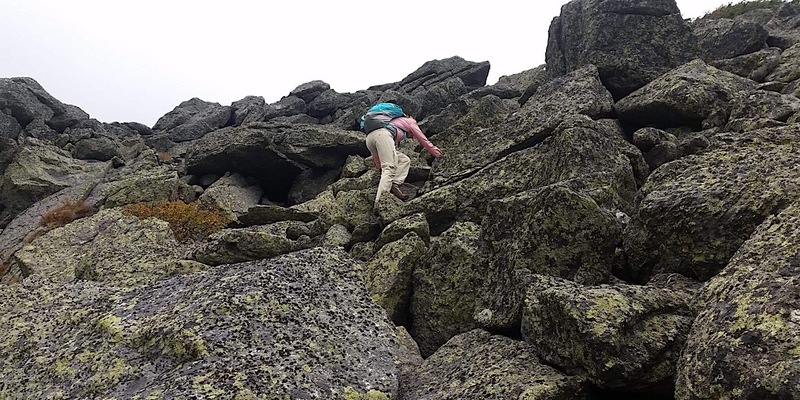 At one time, if someone wanted to enter the area east of Franconia Ridge, toward Owl’s Head, they might do it by going up and over the ridge then descending the east side of Lincoln via an old slide path. This is what we are offering now. The ascent of the ridge will be via one of the classic hiking trails on the west side of Lafayette to the summit, from which we will traverse part of the ridge before dropping down the other side onto the slide itself. 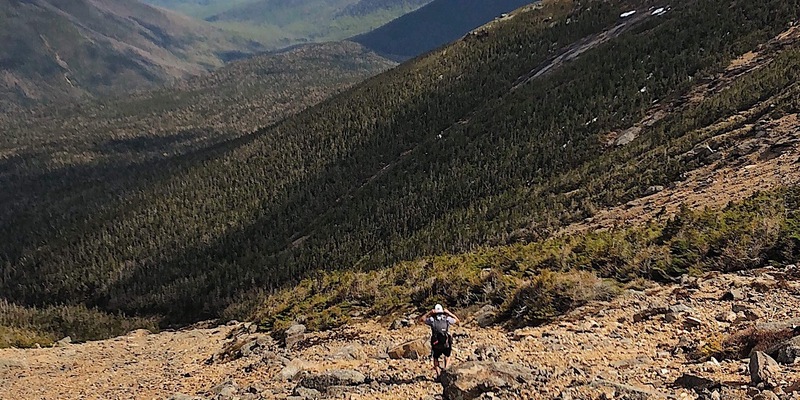 The slide is comprised of smaller talus and is fast and easy to descend amid stunningly beautiful views into the Pemigewasset Wilderness. This is an area seen by few, and visited by fewer. At its base we will enter thick woods making a loose eastward movement until reaching the Lincoln Brook. This we will follow out to the “Black Pond” bushwhack and ultimately Lincoln Woods Trails. This trip makes for a very long day necessitating an early start (for parking reasons, too). Heading down the slide initially is the typical direction. Photo by Philip J. Carcia. Looking back up the slide from the bottom. Photo by Gwenn, used with permission. Of all of the active and inactive trails in the WMNF, the 1971-decommissioned Adams Slide Trail is the steepest in its overall grade rising 1000′ in one half mile section. This means this is one serious route! Not only that, the upper talus fields are protected by a nearly impregnable wall of stunted, tough-as-nails spruce krummholz. Summiting Mt Adams via this route is hard earned badge of honor. You will bleed, cry, then rejoice your success as you summit New Hampshire second tallest mountain. Not only will this hike put hair on your chest (proverbially speaking, ladies), it will allow you to step back in time as you make your way through the Great Gulf Wilderness area to the start of this historic 1934 path, which was present well before this particular 5,552-acre Wilderness was designated as such in 1964. Post-summit descent will be via Buttress, Madison Gulf, or Parapet to Osgood Trails. Wading through a sea of spruce krummholz on this challenging route. Photo by Howard. Nearing the top hikers have to negotiate very steep talus. Photo by Howard. To get started, please book now. We feel this might be popular so we recommend acting quickly. There will be limited spots available on these discounted dates. Cost: Only $149 per person (regularly $200). Reference: Appropriate date and route name from above. Gear: Regular hiking gear plus safety glasses needed. Long pants, long sleeves, and gloves recommended. We hope you’ll join us — these are going to be fun and exciting adventures!